Other names included Ohe and Mena and was referred to first as "The Fighter" and then as "The Established" and the "Unifier of the Two Lands"
Name of Previous Pharaoh: Possibly Horus Narmer "Catfish"
Biography and accomplishments or why Menes was famous: As a military commander who was the first ruler to unite Egypt under one rule starting the Ancient Egyptian civilisation and the power of the Pharaohs. Menes also established the famous capital of Memphis. 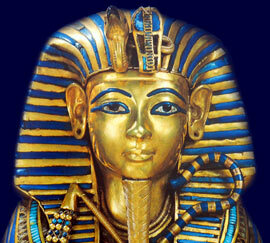 Memphis, in Lower Egypt, was founded around 3100 BC and started the first dynasty of the Old Kingdom. The religion of Ancient Egypt was also established combining the worship of gods such as Horus, Ptah and Set with the other old gods. Temples were built during his reign to honor these gods. The wealth of Egypt prospered during this period and trading was promoted with the traded with the Syrians, Palestinians, Libyans, and Mesopotamians. Each section of this Ancient Egyptian website addresses all topics and provides interesting facts and information about the Golden Age of Pharaohs and of Menes. The Sitemap provides full details of all of the information and facts provided about the fascinating subject of the Ancient Egyptian Kings - their life, family, reign, dynasty, important dates and events and accomplishments.